This page attempts to record what is known about the origin and history of the origami design I call the Mitre and its various developments includinhg the Pencil Case. Please contact me if you know any of this information is incorrect or if you have any other information that should be added. Thank you. 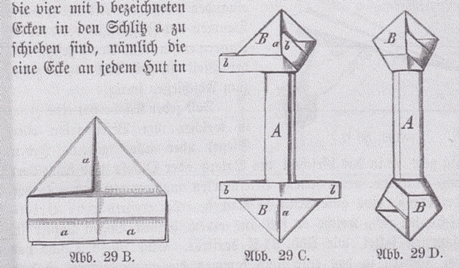 Both designs also appear in 'Des Kindes Erste Beschaftigungsbuch' by E Barth and W Niederley, which was first published in Bielefeld and Leipzig, and the foreword of which is dated October 1876. This book also uses the Mitre to help turn the Suit of Clothes into a human figure. As far as I know these designs first appear in the historical record in part two of 'The Kindergarten Guide' by Maria Kraus Boelte and John Kraus, which was probably first published by E. Steiger and Company in New York in 1882. The Mitre is called 'The Purse' in this book. The Pencil Case also appears in Eleonore Heerwart's 'Course in Paperfolding', which was first published in Dutch in 1895 then in English by Charles and Dible in London and Glasgow in 1896. Th e Mitre and the Doll both also appear in 'Pleasant Work for Busy Fingers' by Maggie Browne, which was published by Cassell and Company in London in 1896. This book is an English version of 'Des Kindes Erste Beschaftigungsbuch'. The Pencil Case also appears in 'Die Frobelschen Beschaftigungen: Das Falten' by Marie Muller-Wunderlich, which was published by Friedrich Brandstetter in Leipzig in 1900. Fun with Paperfolding by Murray and Rigney, which was first published by the Fleming H Revell Company, New York in 1928, uses the Mitre design as a weight for the nose of the Dart.